Perhaps an unofficial, but important indicator of citizenship can be found in yes, you guessed it — our quintessential Singaporean food. National Day’s just around the corner, so in the spirit of patriotism we’ve compiled a list of locally-inspired delights for your next foodie outing. The next time someone asks you to choose leh!, it’ll be no problem at all. Also, we must mention that some of the food items on this list are time-limited, so it’s best you get chomping! Back this National Day is this iconic dish — a savoury combination of succulent crab meat and juicy minced pork meat, wrapped in delicate dumpling skin. What’s even better is that these dumplings are 40% larger than the signature steamed Xiao Long Baos, and are filled with a spicy crab-based broth. When: 1st July – 31st August 2018. *Available for a limited time only. Where: Available at all Din Tai Fung restaurants islandwide. Find out more here. Price: S$7.50/$8 (4 pieces per serving). 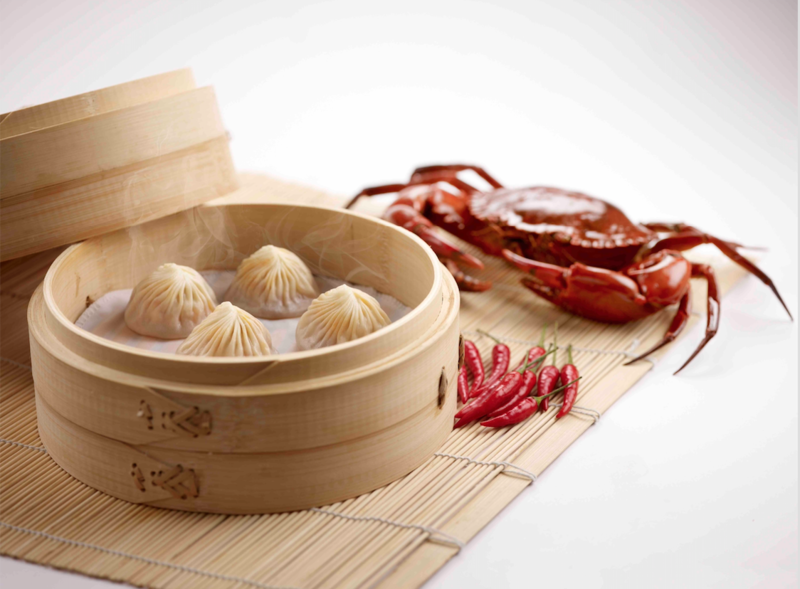 UOB Cardmembers enjoy 10% off Steamed Chilli Crab & Pork Xiao Long Bao. The first thing to know about Open Farm is that most of their ingredients come from local or neighbouring farms. 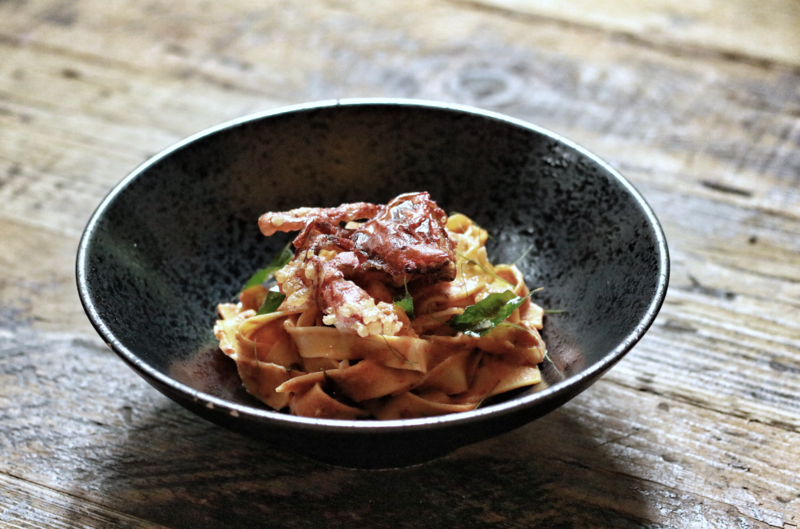 Their Crab & Prawn Laksa Pappardelle is a reinterpretation of Southern Malay Laksa, and includes spices, dried shrimps and coconut milk found in the classic Laksa dish. Besides the usual ingredients though, this dish also incorporates prawns, kaffir lime, curry leaves (straight from their own garden). Additionally, the dish is topped with crispy soft-shell crab tempura for a satisfying blend of textures. When: Available now on the A la Carte Menu. Where: 130E Minden Road Singapore 248819. Find out more here. When: Available from now till end August for a limited time only. Where: Available at all Old Chang Kee outlets, while stocks last. 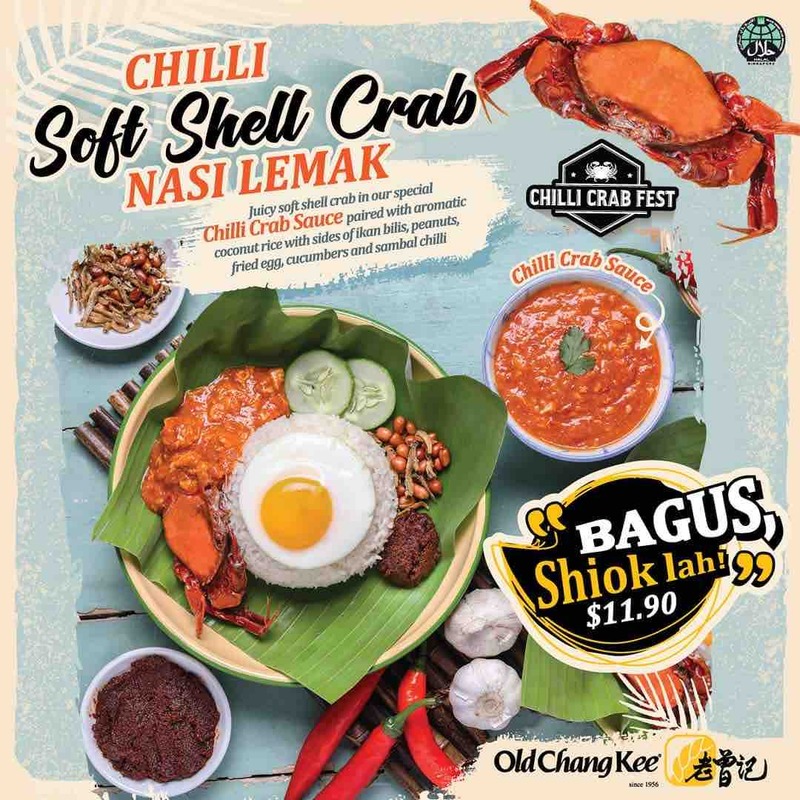 If you’re looking for something more filling though, Old Chang Kee has also launched its Chilli Soft Shell Crab Nasi Lemak. Served with a side of tasty Chilli crab sauce, the juicy soft shell crab dish and its sides of ikan bilis, peanuts, fried eggs, cucumber and sambal chilli sound like a savoury feast. When: Available now for a limited time only. Where: Available only at Old Chang Kee at Kallang Wave. Satay with a twist. 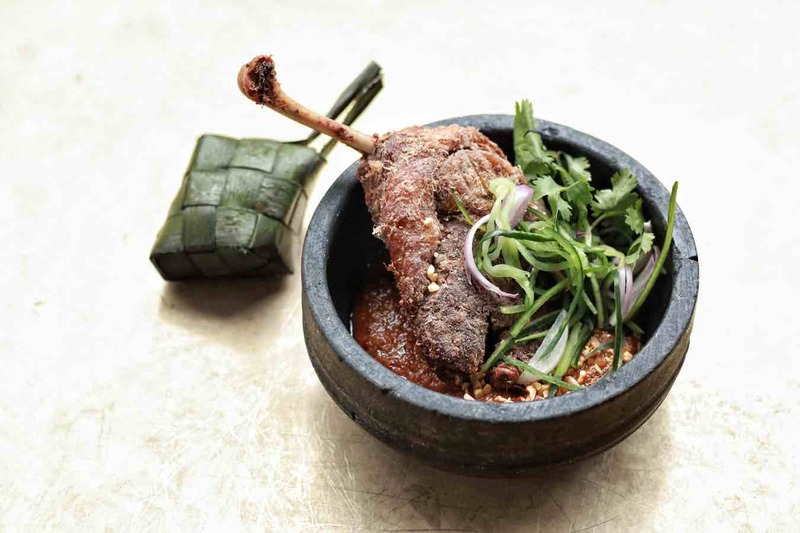 Duck Leg, Satay Sauce, Ketupat, served with fragrant nutty satay sauce is a blend of familiar tastes as we know it. This might quite literally be a mouth-watering dish. 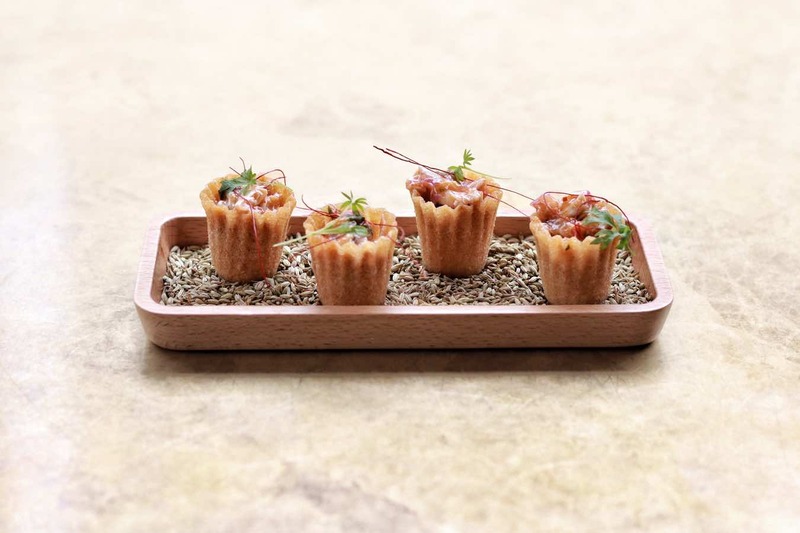 Instead of ketchup, these Kuih Pie Tees are packed with sambal and Singapore chilli crab, which sounds to us a wholesome savoury snack. 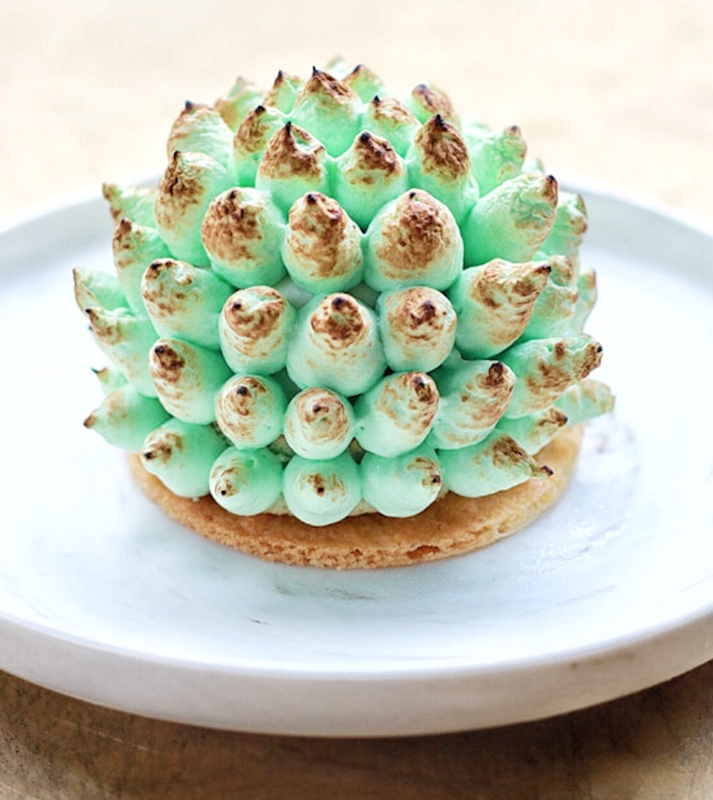 There’s always extra space for dessert (especially when it’s this pretty). This dessert dish comprises of homemade durian ice cream, paired with light and fluffy pandan chiffon cake, and is coated with a light caramelised pandan meringue. The dessert is served on a layer of biscuit, and lathered with house-made durian kaya too. Where: 115 Amoy Street 069935. More information available here. A crumbly Pandan lava cookie fused with rich Gula Melaka and topped with coconut shavings, this sweet treat is a mix of our favourite local flavours, especially when topped with Milo Dinosaur Ice Cream. When: Available from now till 8th August, for a limited time only. 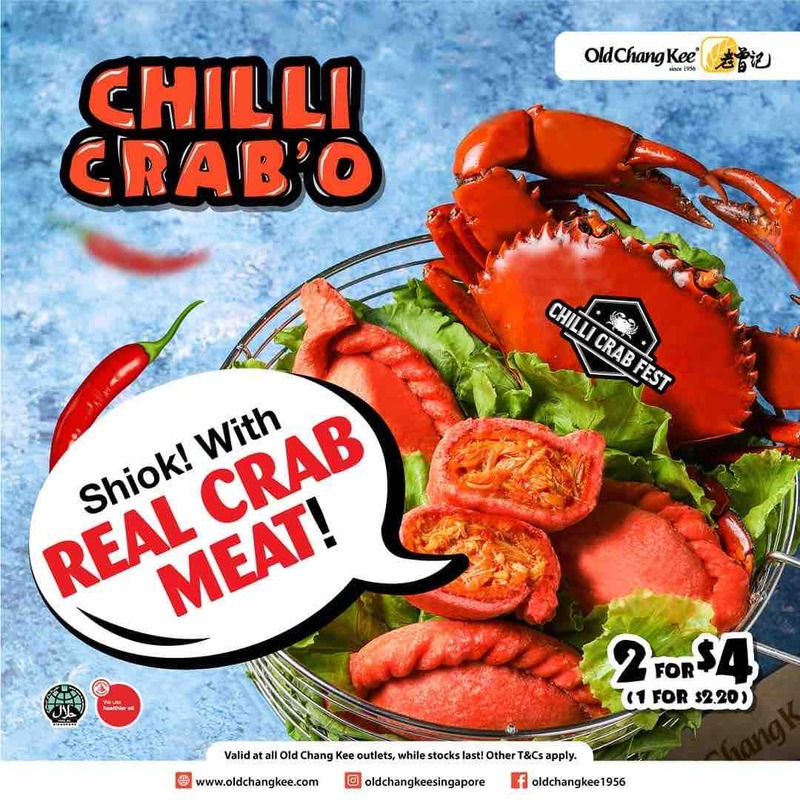 If you’re a huge fan of our favourite chilli crab dish, then you’ll be delighted to know that it will soon also become a dessert. Who said it was just limited to mains? When: Available from 9th – 31st August, for a limited time only. Where: 139 Tyrwhitt Road #01-03 Singapore 207557. Find out more here. Besides other quirky flavours like Teh Tarik, or Bak Kwa, The Kettle Gourmet also sells Chicken Rice popcorn so that you have your favourite local dishes in snack form. Upon opening the bag, you’ll likely be (pleasantly) surprised by how much it manages to capture the aroma of chicken rice. Each kernel is backed with the traditional soy sauce, along with a tinge of cucumber and parsley. Underneath the taste of chicken though, is still your sweet caramelized popcorn, so you’ll get both sweet and savoury in this. The richness of the D24 Durian meets cold brewed Jasmine tea in this invention by Hi Tea. 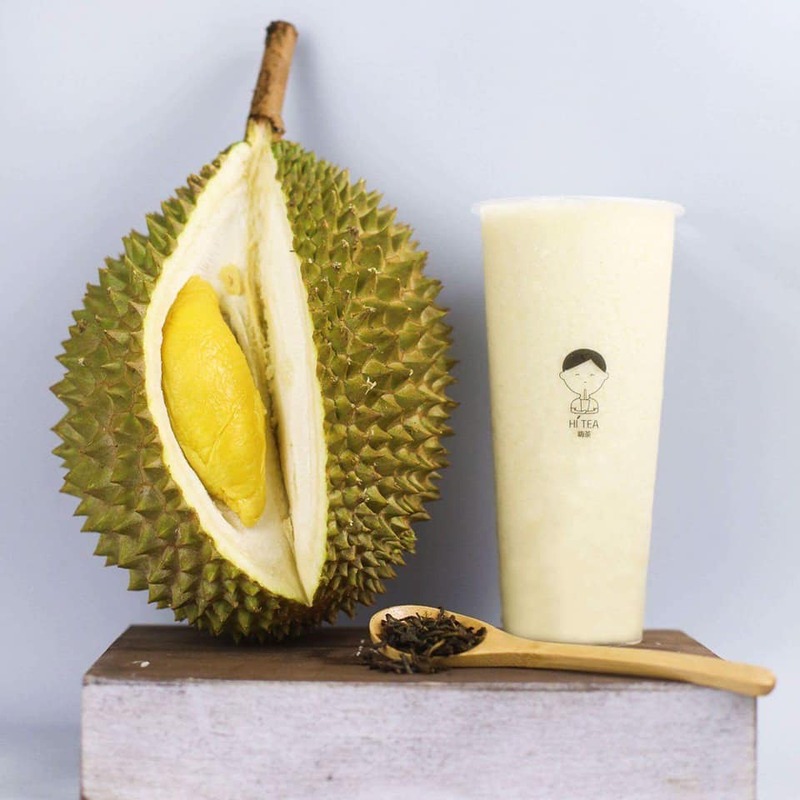 Apparently endorsed even by Durian seller uncles themselves, reviews online write that it’s refreshing, and not too heavy for a drink. There’s only one way for you to find out, and that’s to get yourself one. Where: Available at Hi Tea Far East Plaza Café and Hi Tea North Point City Outlet. Find out more here. Tom’s Palette itself promises that this one ain’t as weird or scary as it sounds. What’s more – it’s almost sold out, so the only other time you can attempt to try it is during the National Day week in August. Made with Kwong Who Hing Factory chee cheong fun sauce that is known to carry the sesame fragrance, this novelty is certainly one for the books…and our stomachs. Reviews also write that the ice cream is of an interesting texture, and the sesame seeds provide a nicely roasted taste. When: Available now (while stocks last), and will be brought back again during the week of National Day. 189702 Singapore. Find out more here. The salted egg yolk trend hit our shores maybe sometime in the last two years, and we’re delighted to know that it continues to live on. 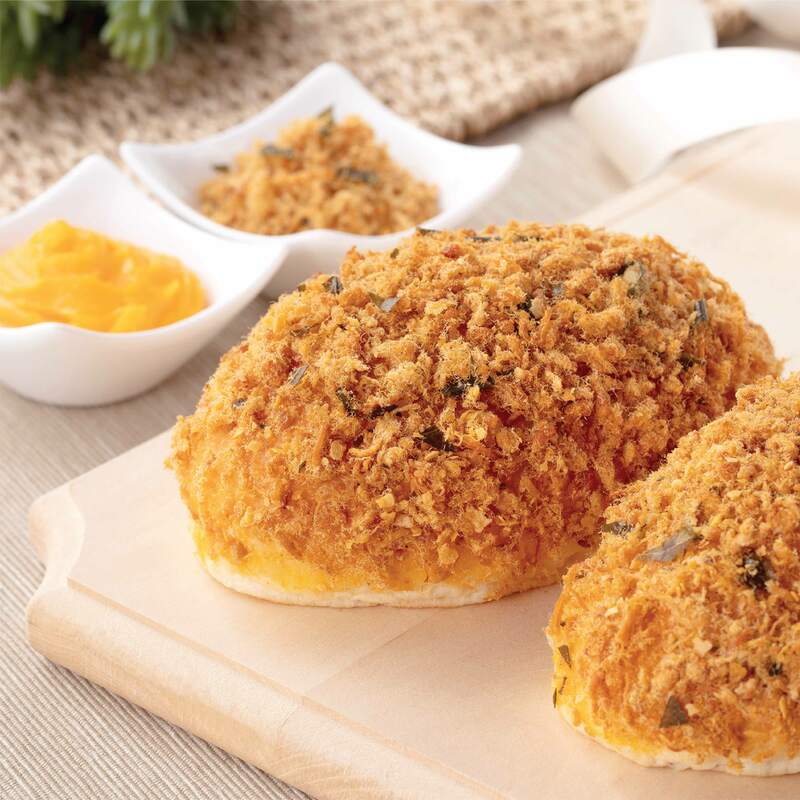 Bread Talk just revealed its Golden Lava Flosss, a floss bun with a salted egg yolk center. Coated with floss and buttery cereal, the bun, inspired by a local tze char flavor, celebrates Bread Talk’s 18th Anniversary and the country’s birthday. And no, we didn’t make a typo. It’s flosss (with an extra s). Guess there’s a lot of floss on this one, which is always good news. When: Available now till 2nd Sept 2018 (while stocks last). Promotion: Mix and match 6 floss buns for $8 from now till 22nd July. *Valid for Flosss, Fire Flosss and Golden Lava Flosss. Valid at all BreadTalk outlets except CityLink Mall, ION Orchard Link, Raffles City, Resorts World Sentosa, Singapore Cruise Centre and VivoCity, while stocks last. Find out more here. Images from Burger King Singapore. Left: Hainanese Tendergrill Chicken Burger. Right: Double Rendang Beef Burger. The Rendang burger is back, this time as a double patty burger (because things get better and better). Read more about the Double Rendang Beef Burger here. You can also opt for a Tendergrill chicken patty in place of beef with the Rendang sauce. Also, the Hainanese Chicken Tendergrill burger is also a thing, in case you missed it. When: Available now for a limited time only. Find out more here. Where: Burger King outlets islandwide. Price: Value meals start from $7.95, and combo meals at $17.90. In case you missed it, here’s a quick rundown: McDonald’s just released a burger and wings inspired by Ha Cheong Gai, alongside its D24 ice cream and kueh salat cake. Read more about it here. Where: McDonald’s outlets islandwide. Find out more here. Price: Prices will start at $6.05 for the Ha Ha Cheong Gai burger. Ha Ha Cheong Gai Chicken Drumlets cost $2.20 for 2pcs. All aboard the salted egg bandwagon! A combination of salted egg, chilli, fragrant curry leaves and sweet basil, these crunchy chicken wings are as they call it, finger lickin good. When: Available now, while stocks last. Where: KFC outlets islandwide. Find out more here. Price: A Goldspice 2pcs Meal costs $8.55. Goldspice 5 pcs meal also available at $19.55. Meal bundles and pricings differ at selected KFC restaurants and for delivery. Promotion is not available at KFC KidZania, Sentosa and Singapore Zoo. Image from Starbucks Singapore. 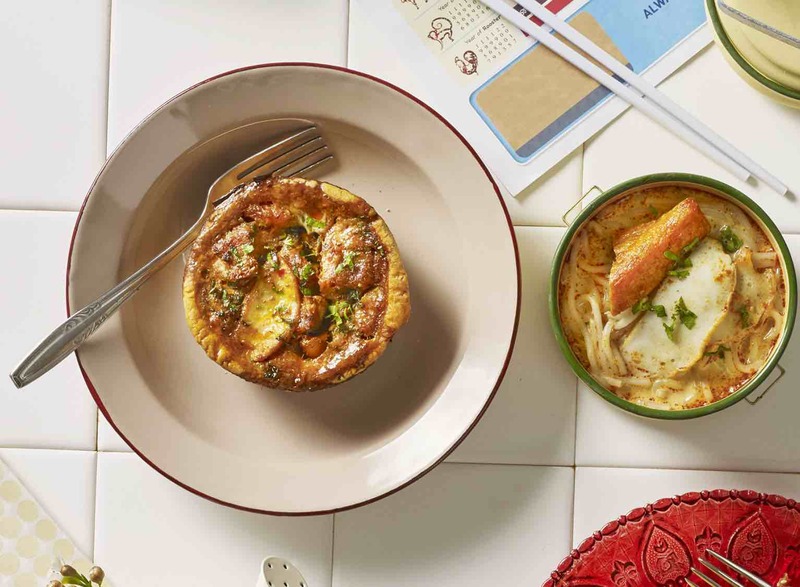 Pictured: “Mai Hum” Chicken Laksa pie. The essence of the classic laksa, just without the noodles, topped with aromatic laksa leaves. Image from Starbucks Singapore. Pictured: “Hiam Ah” Devil’s Curry pie. A delicious mix of egg, potato and chicken sausage wrapped in a crisp pastry with curry filling. Starbucks hasn’t released much information about their local delights yet, but we already love what we’re seeing. 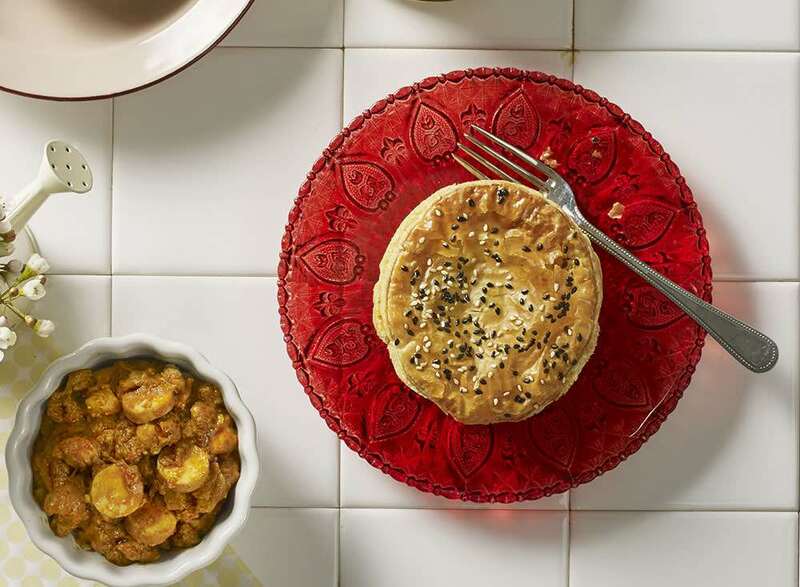 From the savoury “Mai Hum” Chicken Laksa pie and “Hiam Ah” Devil’s Curry pie, we love that even the names of these food items incorporate Singlish in them for a unique Singaporean flavor. Where: For more information, head over to Starbuck’s website here. Mexican tacos for the Singaporean palate? Chimichanga just released national day twin tacos. It’s up to you whether you want to share or have both to yourself! Image from Chimichanga Singapore. 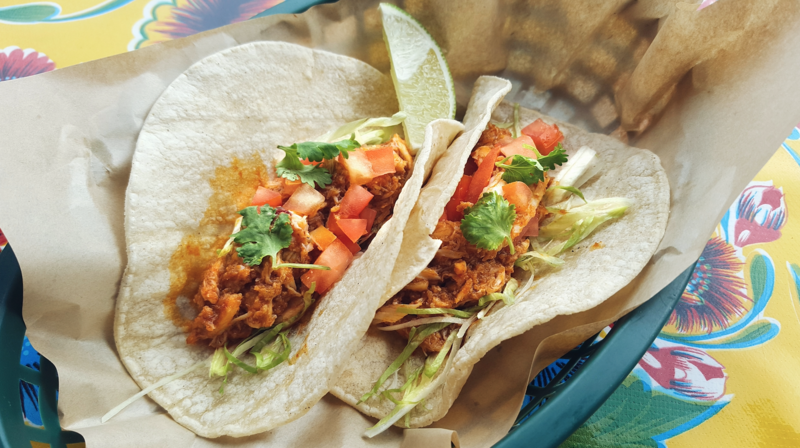 Pictured: Chilli Crab Tacos. Expect shredded mud crab, laden with sweet chilli gravy flecked with eggs and tomatoes atop lettuce and a soft, toasted corn tortilla. Price: S$15 for 2 pcs. Image from Chimichanga Singapore. Pictured: Spicy Beef Rendang Tacos. Tender beef in spicy coconut gravy with onions, wrapped in toasted soft corn tortilla skin. When: Available now till 31st August 2018, for a limited time only. Where: 36 Dunlop Street, Singapore 209364. For reservations, call 6293 3314 or go online. 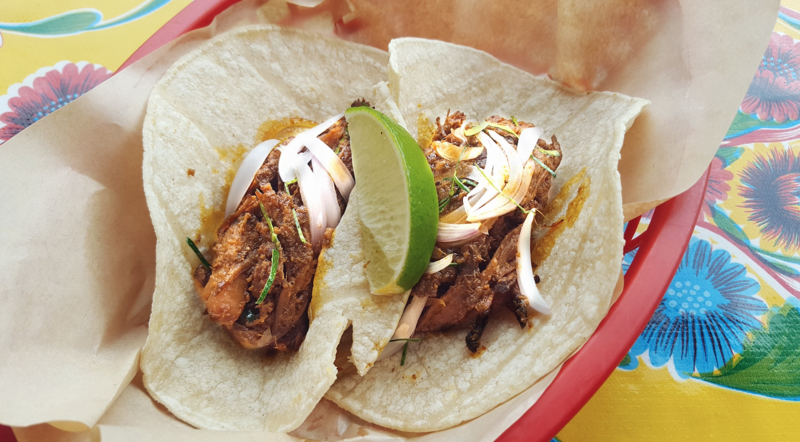 Price: S$15 for 2 pcs (Sweet Chilli Tacos) and S$12 for 2pcs (Spicy Beef Rendang Tacos). Banner images are taken from Din Tai Fung, Open Farm Community, Hi Tea, Chimichanga and BreadTalk.